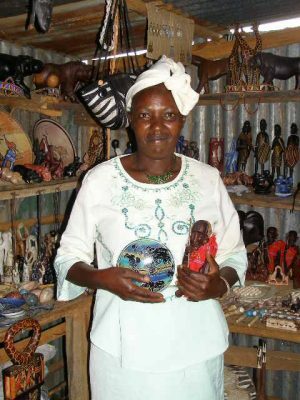 When she’s not promoting her artwork at exhibitions across east Africa, Lily Cheroho Kiegen can be found at her store on the equator crossing just north of Nakuru, Kenya. Here, she sells handmade soapstone carvings and other crafts that she makes. The little store provides her family with a modest living and helps to support Lily’s five children. Lily was born in Chemogoch, Kenya, where she was brought up in a family of nine children. Her father died when she was little, so the family was always struggling financially. Lily completed the first eleven years of a typical twelve-year school program thanks to the help of Action Aid of Kenya: an organization that provided her with the money for school fees. Unfortunately, the program wasn’t able to provide money for her last year of high school, so Lily had to drop out. Once out of school, Lily began to concentrate on improving her skills as an artist. She’d always drawn, even as a small child, and now she began to think seriously about making artwork a part of her life and her income. To practice painting, Lily whitewashed the walls of her house, then used them as a huge canvas, decorating one room at a time. Lily saw the success that other artists were having with soapstone carving, and began to experiment with it. She found an atlas, and was interested in the shapes of the countries and the beauty of the globe. Now, a large part of Lily’s business comes from replicas of that atlas that she carves into egg-shaped soapstone. People always comment on the colors Lily uses in her artwork. Lily says that she buys her paint only from the most reliable source–a man in Kisii, Kenya with the best colors in East Africa. Lily’s source of soapstone is also in this town. Lily’s oldest child has taken an interest in Lily’s business. She now helps out by selling at the store, and even carving a few of her own things, which she sells to raise the money for her textbooks. Recently, Lily has branched out and started decorating Maasai blankets: the garments worn by the Maasai tribe. She’s found that there’s a good market for blankets that have beads and shells sewn onto them.